Västerås, Sweden, 6 September 2018 * * * Percepio, the leader in software trace visualization for embedded systems and IoT, today announced Tracealyzer version 4.2. The new release features a completely rewritten main trace view, and adds support for, among other things, Wittenstein SafeRTOS and tracing via STLINK debug probes. It also brings official support for running on Linux, so developers using Linux hosts are now able to upgrade to the new generation of Tracealyzer. 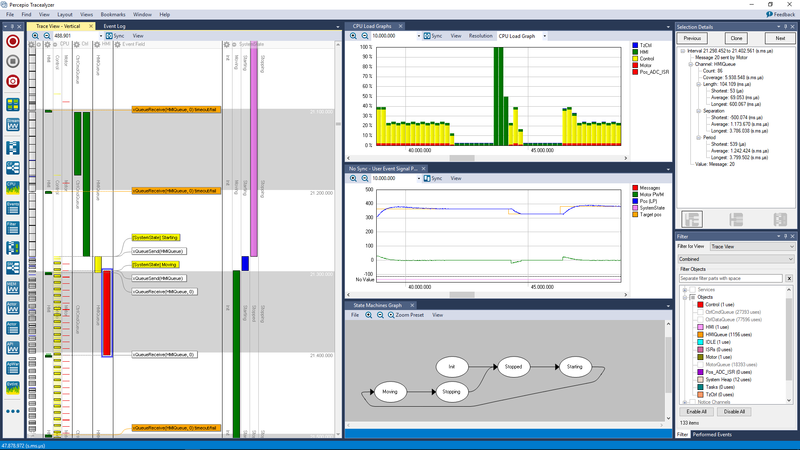 “Among the many new features of Tracealyzer 4.2, the new, innovative trace view stands out. The trace view has always been the signum of Tracealyzer, so this update is a big thing, for us and for all developers out there using Tracealyzer. The trace view has been redesigned from the ground up to give much better options for adjusting the view to match your software architecture, and for fitting more information in the available screen space. The result is awesome and I’m really proud of our developer team for all their hard work and ingenuity,” says Johan Kraft, CEO of Percepio. The new trace view also allows Tracealyzer to display much larger embedded applications than before, with many more threads and RTOS objects. With this release, all the important Tracealyzer 4 features like live view, support for I/O event tracing, and state machine visualization, have become available for users running Tracealyzer on Linux host machines. We are currently developing and testing Tracealyzer on the latest releases of Ubuntu, Fedora, OpenSUSE, and Manjaro XFCE. On the target side we have added streaming support in Wittenstein SafeRTOS and OpenRTOS, which allows for unlimited tracing, e.g. for measuring execution times and response times over very long sessions – something that is important for safety-critical applications. Developers using ST Microelectronics MCUs are now able to trace in streaming mode with ST-LINK debug probes. Tracealyzer 4.2 is available as a free download for registered Tracealyzer 4 users at percepio.com. Tracealyzer v3 users can upgrade to Tracealyzer 4 with prices starting at USD 495 / EUR 395 for a single, node-locked license.